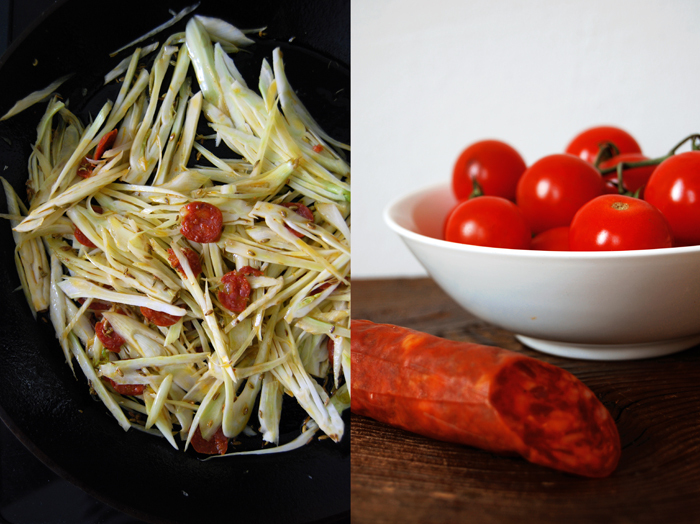 In March I cooked a pasta dish with lots of fennel seeds roasted with crunchy bacon. For the sauce I mixed these aromatic and oily bits and pieces of spice and meat with tinned tomatoes because at that point the fresh ones were still far away from offering more than a watered down hint of what a real tomato tastes like. 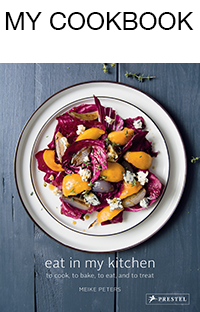 I enjoyed this meal a lot, it was rich and hearty, it felt like comfortable late winter food. The only problem was at that point I was already thinking of all the fresh vegetables I would be cooking with as soon as the cold season would be over. I could see fresh tomatoes, ripe and strong in taste, straight from the market ending up in my pan. 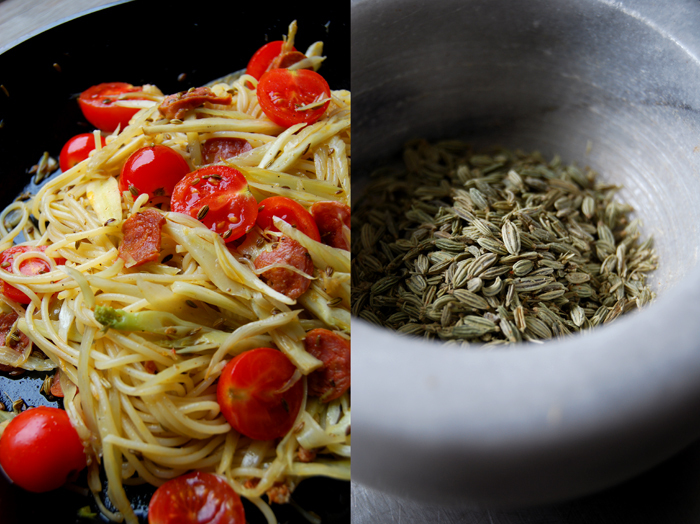 Here’s a pasta meal that was one of my visions for summer which also includes fennel seeds. This time I cook the seeds in a bit more olive oil than I would normally use and let them spread their aroma. 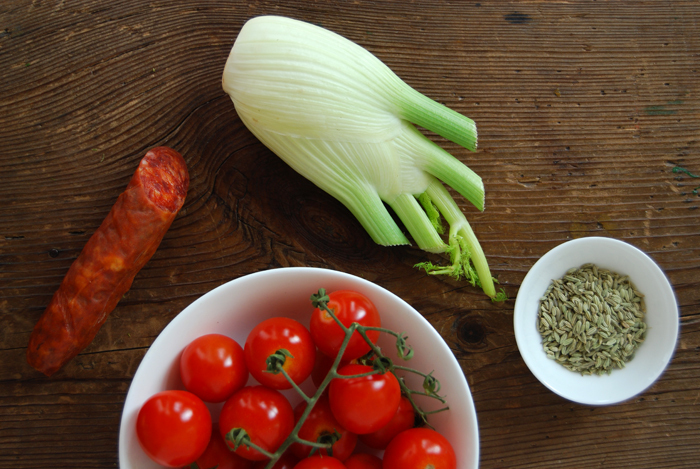 When the oil is infused I cook slices of spicy chorizo in it together with a thinly sliced fennel bulb. The vegetable softens after about 5 minutes of cooking but I make sure that it doesn’t lose its bite, I keep it crisp. To finish the meal off, I mix the spaghetti directly in my heavy pan in these spicy and oily juices and top it with the halves of fresh cherry tomatoes, uncooked, pure and sweet. I dreamt of this meal in March and got it in July. That wasn’t that bad, some things take longer! Cook the spaghetti in lots of salted water al dente. In a large heavy pan, heat up the oil on a medium heat and add the fennel seeds. Let them infuse the oil for 2 minutes, add the chorizo and cook for 1 minute. Add the slices of fennel, cover with a lid and cook for 5 minutes or until al dente. 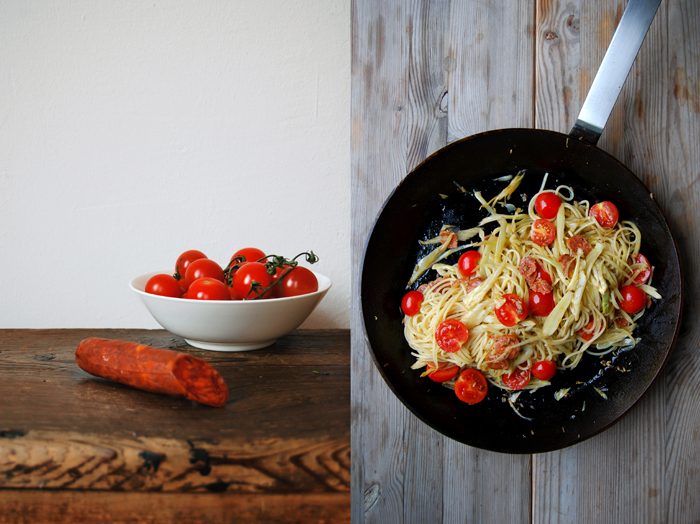 Take the pan off the heat, mix the spaghetti with the vegetable and oil and add the tomatoes. Season with salt and pepper to taste and serve immediately. Such a lovely summer supper!